The Red Wings put forth a nearly-full-game effort on Monday night in the last home opener at Joe Louis Arena, as opposed to the 20-minute efforts to open the season in Tampa and Sunrise, and it got them a 5-1 win over the Ottawa Senators. Yeah, there were negatives. There were shifts where they shot themselves in the foot trying to clear the zone. There were still too many missed passes. In a game that it feels like the Red Wings dominated, they still allowed 32 shots. But there were more positives than we saw in the first two games, too. Mike Green‘s shot has been unleashed. He’s doing what he was brought to Detroit to do and has his first career hat trick to show for it. Two nights after an awful outing, he had maybe his best game as a Red Wing. And Darren Helm finished, too. I don’t know what he did over the summer but he looks like he’s skating better than he has in a couple years. Thomas Vanek with three assists is having an impressive start to the season. I don’t recall Petr Mrazek having to make any insane saves – like he did in Tampa, for example – but after allowing eight goals in two games, he needed a shutdown night. Only goal against came on a rush where the puck deflected off a teammate’s stick. Not bad. And speaking of that goal… I said it on Twitter, I’ll say it again here, I really liked Brendan Smith‘s effort on that play. He forced Dzingel to wait until it should have been too late. If that pass didn’t go off Sheahan’s stick and past Mrazek, I think it ends up in Turris’ skates, not in the net. I will say that I don’t love the fights. I don’t think fighting is a necessary part of hockey. I liked seeing Chris Neil beg for a fight and then Justin Abdelkader land some solid shots on him, but at the same time I wish Abdelkader hadn’t obliged him. It is interesting, though that the Wings’ fights this season have all been by players who were with the team last year (since Steve Ott‘s “fight” in Tampa was just roughing). This isn’t a new player skewing the numbers, it’s the existing players playing differently. I wonder where that change came from. Of course, I have to talk about the arena itself and the game presentation. While there was a lot of talk of this being the last home opener at Joe Louis Arena, I don’t feel like the “last” aspect was played up. There are at least 40 more games left there, including the actual last game. This felt like a home opener, not a last game. As it should. 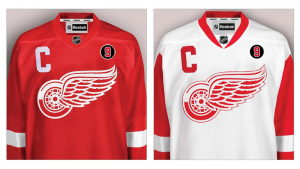 It kind of annoys me that the Wings ended up dropping the Farewell to the Joe patch from their jerseys. I didn’t like it, and I think they could have done better on the Gordie Howe patch, but there’s no reason they couldn’t have done both. I’ve already established that I’m rarely a fan of the design choices made by the Red Wings or the Griffins. 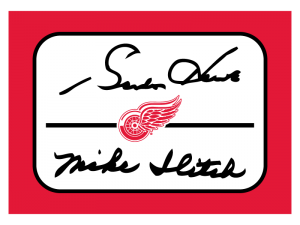 As such, it should come as no surprise that I’m disappointed by the patch that the Wings will be wearing this season to honor Gordie Howe. It’s a 9 in a box. Why is it in a box? So that you know it’s a patch? That makes no sense to me. So you’ve got two design elements and one of them is pointless. The following are my attempts to make it better. My first version simply takes the existing patches and switches which jersey they’re on. By having a contrasting background, you still get the “Hey, this is a patch” thing they seem to be going for without looking like “a 9 in a box” as I said above. If you’re insistent on the number itself being the contrasting color, eliminate the box completely and just go with the 9 as a patch. Personally, I think this would look better on the shoulder of the sweater (similar to what the Philadelphia Flyers did for Pelle Lindbergh), but I get that there’s symbolism to having the patch over the players’ hearts. I like the tried-and-true method of a black circle with a number or initials inside it. This could go on the chest or on the shoulder. This is my personal favorite, the following three are really just here to show that there are ways to play with it a bit more. If you’re looking for something a little bit more branded, make the number red with a white outline on the black patch. I think that even with a white outline, the red blends into the black a bit much, though. Or you can go way out there and have the Winged Wheel inside the #9. Personally, I don’t think this looks very good in this application, but it was the image DH.N ran with at the time of Howe’s death. Finally, you could go with a version that has a bit more information. In this case, the 9 is black with a white outline on a red circle. A black circle wraps that, inside of which is the text “Mr. Hockey Gordie Howe 1928-2016.” It’s more complicated than it needs to be but I still think it’s better than a 9 in a box. I’m glad that the Red Wings are honoring Howe on their jerseys. I think they could have done worse. I just also think that they could have done better, and Howe deserves better. I never met Gordie Howe. I’m too young to have seen him play, outside of his one-shift stint with the Detroit Vipers. I am not the person to eulogize him. We all know the stories. They’re pouring out onto the internet today. Stories that make us laugh. Stories that remind us of Old Time Hockey. They’ve been told for years, the legends of our sport. There’s one story that always sticks with me. One video clip from the end of his career. His introduction at the 1980 NHL All-Star Game. The last All-Star Game of his career, returning to the NHL after it absorbed the WHA, his only NHL season not played with the Red Wings, and a game played in Detroit. Gordie Howe transcended his own name. He defined a number. He defined a sport.